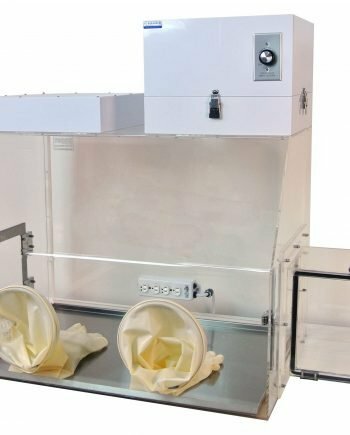 2400 series closed-loop filtration glove boxes offer a combination of the 2100 series isolation glove box and the HEPA filtration of the 2300 series glove boxes. 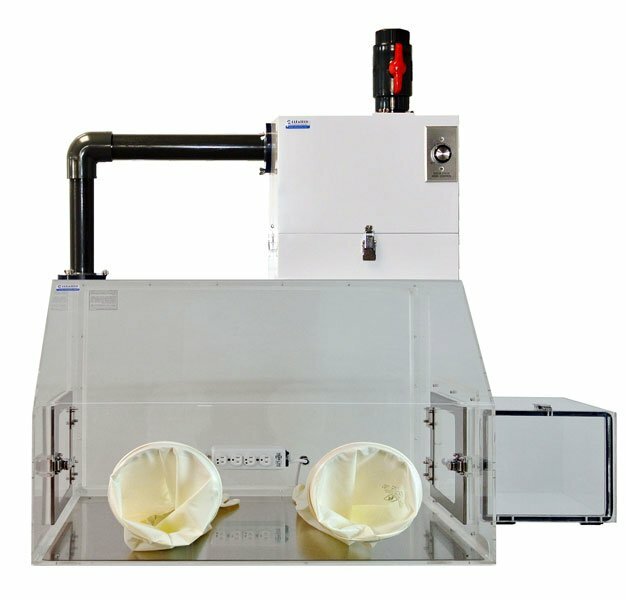 The 2400 series gloveboxes provide a low humidity and a clean, particulate controlled environment for critical processing operations in nanotechnology, semiconductor and pharmaceutical industries. ¼’’ Thick Clear Static-Dissipative Acrylic. Static dissipative coating increases the chemical resistance of acrylic when compared to non-coated acrylic. Excellent optical properties with no color tint. Two access doors open outwards (or inwards upon request) for negative pressure configuration. 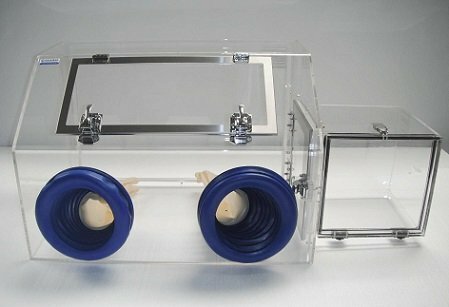 If an airlock is included, airlock doors open inwards. Doors include a stainless steel door frame, hinge, one-piece non-adhesive sealing. 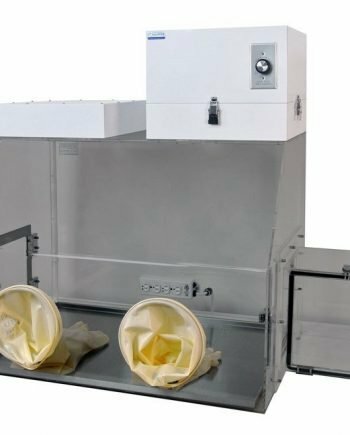 Blower module, adjustable speed, backward curved impeller 480-CFM, permanently lubricated, automatic reset thermal overload protection, 120VAC, 60Hz, UL Listed; CSA Certified; Enclosed in a polypropylene housing. Primary HEPA filter is 99.97% efficient at trapping particles as small as 0.3 microns. Filter media is ultra-fine glass fiber and is 3″ thick. The maximum temperature is 180° and the filter meets UL Class 2 flame retardant requirements. Secondary HEPA filter is 99.97% efficient at trapping particles as small as 0.3 microns. ULPA filter is 99.999% efficient at trapping particles as small as 0.12 microns. The 3’’ thick filter removes contaminants from the exhaust gas, making it safe for indoor release. Gas-in port & pressure relief valve is required when using cold dry air (CDA), nitrogen or an inert gas to reduce humidity. Hospital-grade power strip with four outlets that provide 110 VAC. Designed to be utilized within the glovebox workspace. Stainless steel work surface or spill tray helps to limit surface damage. 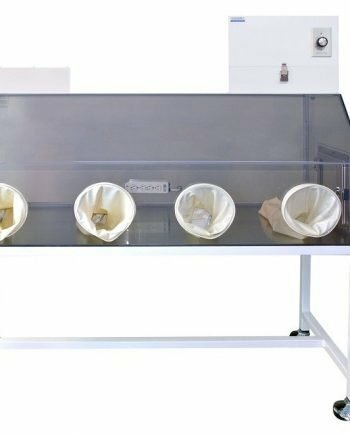 Recommended for Static Dissipative PVC gloveboxes to protect the anti-static coating. Epoxy powder coated steel stand with caster (including two locking). Clean room compatible, the stands are available in 30'' and 35'' height with an optional upgrade to leveling mounts.